I have magnavox dvd/cd player with video cassete recorder model DV220MW9 dvd player works. However I have not been able to vcr to play need help. Did you change the inputs on your tv to match where you are hooked into? If I understand your request right, You do not have cable or satellite box. You can not record from your TV. You use the TV as a monitor from the dvd/vcr combo box. What the box receives is what shows on the TV. So you will have to have a digital convertor hooked to the (antenna in) dvd/vcr combo box, (antenna out to the tv antenna in) Depending on the antenna you are using that is on the other end of your cable-in coax connection this will hook to your antenna in on the digital convertor box. If your cable is hooked up and operating correctly and directly to the tv that is digital ready you probabbly have a good picture. When the vhf/uhf signal was transmitted you could go from the dvd/vcr to the tv with no problem. But now that the signal is digital and the tv is set for digital the dvd/vcr will not pass a digital signal to the tv. Best suggestion, you have to get a digital dvd/vcr receiver. If you have more question please contact me. You will need to get new cables. check out this diagram, paying close attention to the audio video cable hookups. you are going to come out of the converter box audio and video outputs into the new magnavox dvd/vcr combo audio and video inputs. Then out of the new magnavox dvd/vcr combo outputs to the inputs on the tv if it has such inputs. The TV will have to operate on the video input 1 or 2 if the tv has such a thing, use the remote for the tv to adjust the input signal to line in 1 or 2 depending on what it has. If the tv has no coaxial input or audio video inputs then you might have to use an adapter, you can get these from radio shack. You say it will not record from the tv, but in all actuality the dvd vcr combo is getting the signal from the converter box not the tv, do you understand what I mean here? So the dvd vcr combo gets input from the converter box so you will have to set it to view signal from the line input you have plugged in from the converter box. line 1 or 2 or whatever the input is. the tv will have to be set on the line input to view the signal from the dvd vcr combo. That is as easy as I can put it. Study the diagram closely. You will see what I mean. Connect your rabbit ears to the Insignia. Connect the Insignia to the antenna input on the "cvd/vcr combo". Now turn on the television to show the "cvd/vcr combo". The Insignia simply goes between your antenna and your television. In your case you also have a vcr so if you want the VCR to be able to play and record digital stations you will need the Insignia between the vcr and the antenna. Is simply. 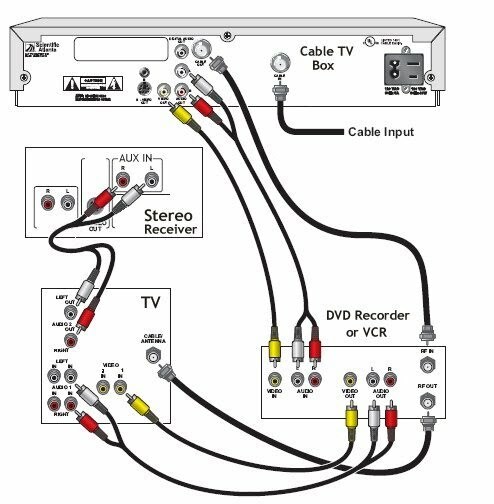 get the audio/vido cables and look on the back of the TV and connect from the audio video outputs from the combo to the audio video inputs on the tv. remember the colors of the terminals and connect them that matches the red, white (audio) and the yellow (video). Using the remote locate the button "input" or "source", and select video 1 or 2, depending where you connected it. I am not sure I understand why you would hook a dvd player to your combo.You should just hook your magnavox directly to your tv. Even if you do get it connected you cannot copy from vhs to dvd as you have bought a vcr recorder with dvd player, not a dvd recorder. You can only record to the vcr tape from a dvd, in the players controls.